This star has the designation 41 Lyn but is assigned to UMa. 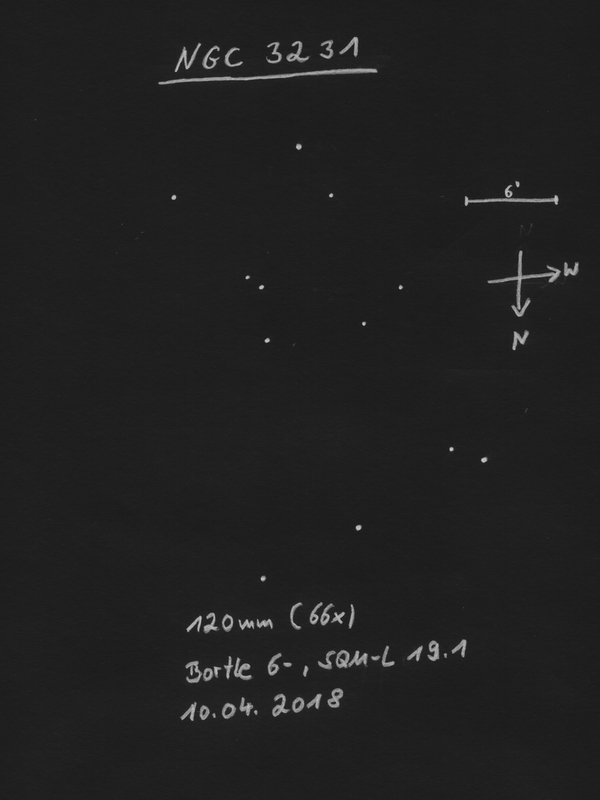 At the time, when Flamsteed numbered the stars, the constellation boundaries were not exactly defined. 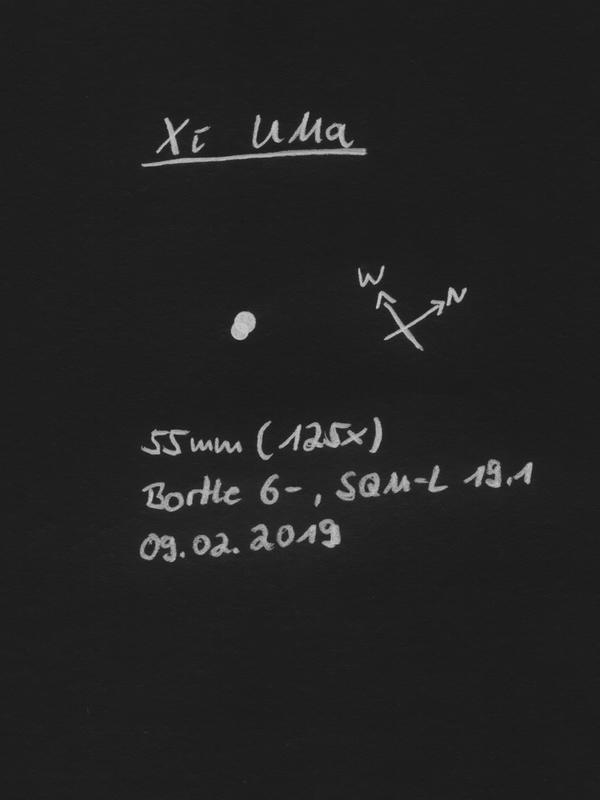 Another example is 10 UMa, which is located in Lyn today. Fairly well split with fainter component. 2016-01-22: At 18x too faint, at 40x and 75x at most slightly orange colored. 2016-01-21: At 18x faint without noticeable coloring. At 40x and 75x at most slightly orange. Oval, condensed brightening. Almost visible with direct vision. Quite apparent with averted vision, slightly oval with a bit brighter center. Oval with much more brighter center. SQM-L 19.3: Very bright, extended, round core with oval halo fading outwards. Observation at full moon: Oval with obviously brighter, also oval core area. Easily seen with direct vision. Very bright, round, extended core with fainter halo. Extremely faint, roundish, evenly bright. Fairly well seen with averted vision but faint. Roundish, evenly bright, moderately large. Less obvious. Permanently held with averted vision as slightly elongated brightening. Overall a very bright galaxy, which can be seen with smaller telescopes and is easy to find. Northwest less than 1° you can find the vividly colored carbon star RT UMa! Obviously elongated with brighter, oval core area. Well seen with averted vision. Despite nearly full moon (angular distance about 50°) the galaxy was quite well visible with averted vision and apparent slightly condensed, oval. Barely seen with averted vision as very faint, oval brightening. About 5 stars scattered. Not discernible as an open cluster. Arp205 covers besides NGC3448 also the very faint companion UGC6016. 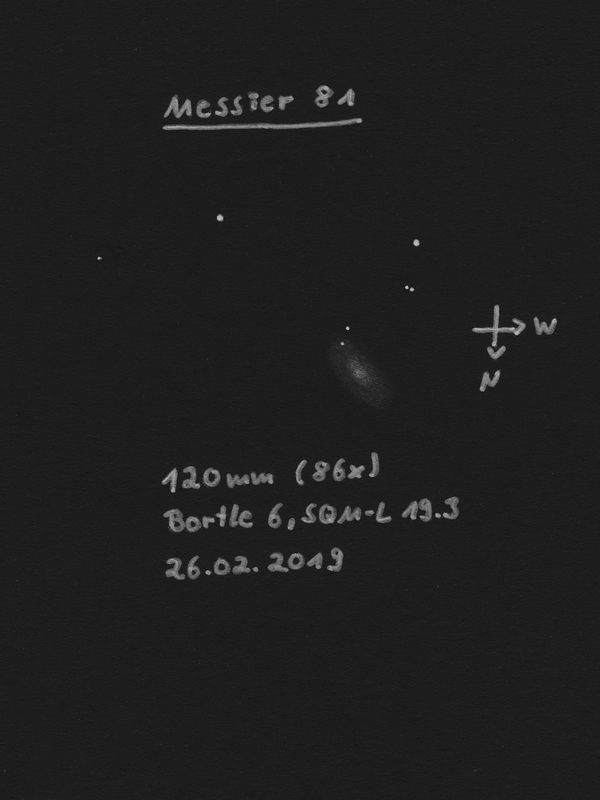 It is located southwest of NGC3448 and faintly visible on the DSS image. 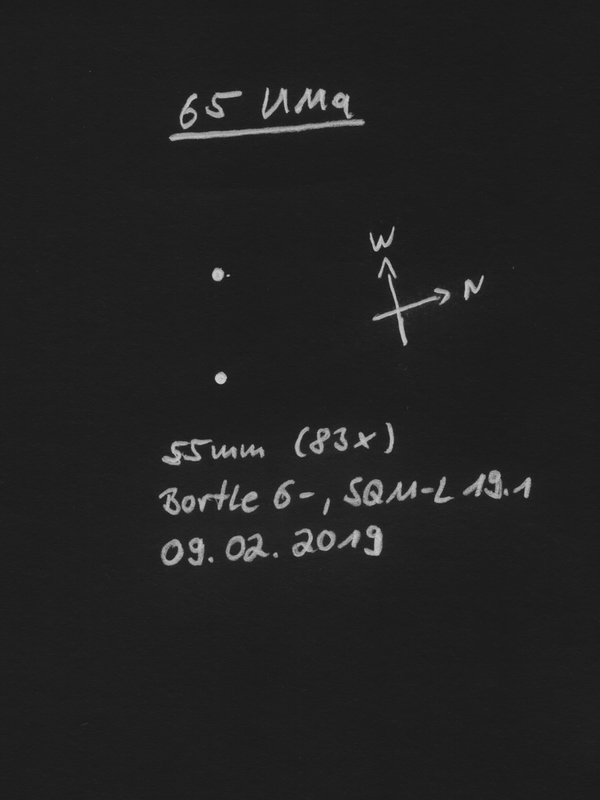 At 48x and 66x elongated and evenly bright. Relatively faint, elongated, evenly bright. Almost N-S oriented. Chi UMa interferes and was placed outside of the field of view. Tried with a low cost spotting scope. Relatively faint, roundish to slightly oval, evenly bright. 2013-12-29: Very vividly colored, deep red/crimson. At 100x and 150x not permanently split. Components very close together. 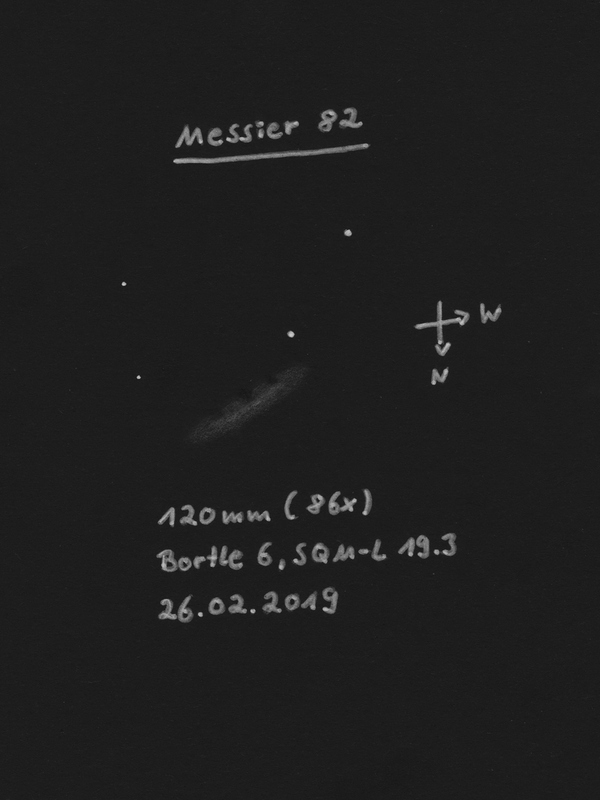 2019-02-09: Already seen as '8' at 83x. At 125x the overlapping of both Airy disks was visible, but also a slight difference in brightness. 2018-02-18: Very close together with similar brightness. At first glance seen as an '8', looking closer I partly split both components. Similar view also at 128x. 2018-02-14: Well split with slight difference in brightness. 2019-02-06: Well split with visible difference in brightness. The colors of both components appeared equal. Easy to split, but the faint C component only appeared as a tiny star. Easy to separate with large distance and very small difference in brightness. The D-component showed a bluish tint, the lighter one (AB) a slightly yellowish tint. At higher magnification also the faint C component is visible.